The best selling Contour Ballpen has been redesigned to create the unique Contour Digital Ballpen. Its patented barrel provides an unrivalled print area to maximise the full colour potential of photo-quality images and promote your corporate image to its very best advantage. 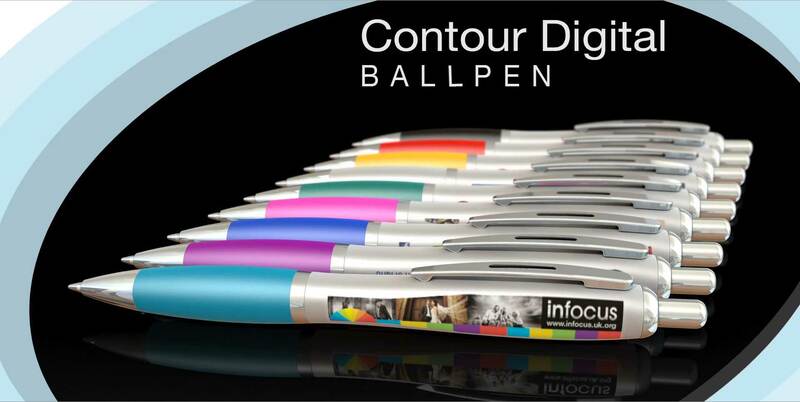 Full colour digital printing uses the very latest technology to bring promotional pens up to date with multi media marketing platforms, making the Contour Digital Ballpen an ideal choice for sophisticated campaigns. The Contour Digital features a sculpted white barrel and a choice of 10 brightly coloured soft rubberised grips. Chrome clips and trims complete the smart overall look and the pen meets stringent British and European safety standards. This innovative pen is also available on an accelerated three day express service to ensure you meet those important, last minute deadlines. The Contour Digital is supplied fitted with a high capacity ink refill containing documental quality ink as standard and is also available as a gel pen. Augment the pen by adding optional accessories and pen pots to make the perfect business gift for style conscious clients. Order the inimitable Contour Digital Ballpen today to take advantage of the exceptional branding opportunities it affords.